The CEO of WWE will address Kofi Kingston’s warning on tonight’s episode of SmackDown Live. 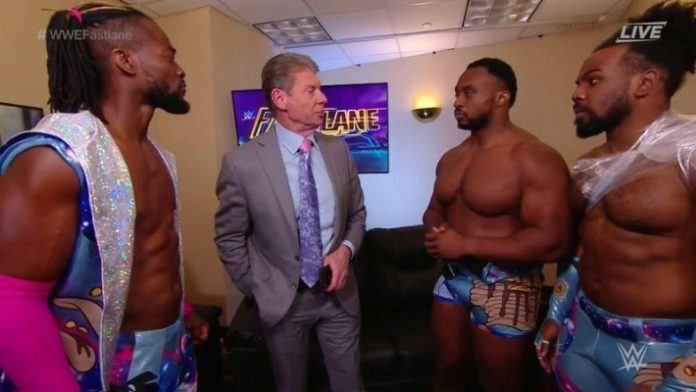 For those who are unaware of what took place at Sunday’s Fastlane event (full results here), Kofi Kingston was told during the pre-show that Mr. McMahon wanted to talk to him about the WWE Championship match which was set to take place later in the night. McMahon told Kingston that he would be added in the WWE Championship match between Daniel Bryan and Kevin Owens (who replaced Kingston in the first place), making it a triple-threat match, with the condition that The New Day will be banned from ringside. When Kingston made it to the ring he was informed that McMahon actually lied and he was set up for a two-on-one handicap match against The Bar. Needless to say, The Bar was heavy on Kingston as both Sheamus and Cesaro were allowed to be in the ring at the same time. Big E and Woods came out to the aid of The New Day member, but Shinsuke Nakamura and Rusev stopped them. The Bar won by hitting a double White Noise on Kingston. In what must have been very hurtful for Kingston, Mustafa Ali was later added in the WWE Championship match, making it a triple-threat. The arena was filled with “We want Kofi” chants during the majority of the beginning of the bout. Kingston rightfully took to Twitter on Monday afternoon to tell McMahon that he is not going anywhere and he will see him on SmackDown. It was later confirmed by WWE that McMahon will appear on SmackDown to address Kingston’s warning. I’m not sure what Vince was trying to accomplish last night, but one thing became very clear: He does not want to see me as WWE Champion. After 11 years, I finally have your attention…and I’m not going away. See you Tuesday @VinceMcMahon ? Tonight’s SmackDown Live will be taking place at the Nutter Center in Dayton, OH. Make sure to visit SEScoops for full coverage.